Summer break is a good opportunity to get a kid with special needs into the swing of doing chores. If your child is anything like Max, it takes some doing for him or her to adapt to new habits. And of course, you always can bribe them with ice-cream. Ha, ha. "Chores provide the opportunity for parents to provide creative meaningful opportunities for children," notes Bob Cunningham, MA, EdM, the in-house advisor on learning and attention issues for Understood.org and head of school at the Robert Louis Stevenson School in New York City. Check out his top tips on getting children to do chores that they'll want to keep on doing. Assign a chore that is important to them, which makes it easier to remember. Of course, getting the chores done may ultimately help you, but first and foremost you want to make your child feel invested in them. • Do activity prep. If your child plays sports or attends a dance or art class, give them a chore that impacts their ability to attend. For example, ask them to pack their supplies and materials the night before. This teaches preparation and provides extra incentive for focus. • Try electronic engagement. If your kid is into technology, ask her to make sure everyone's electronic devices are plugged in and charged before bedtime (a highly motivating task that involves moving around the house). Or if she likes video games, have her organize her gaming space several times a week. These children needs tasks that are safe and make them feel confident. Focus on ones that do not involve extra steps or movements—think sitting in one place and organizing things. • Do desktop cleanup. Assign a child the task of organizing the family’s computer each week. Ask them to help arrange files and delete excess images saved to the desktop. Carrying over skills learned in school, including using the mouse or track pad, can reinforce their learning. • Create a weekly schedule. This can be dedicated to the child or the entire family. It's something that a child of any age can help with, and keeps things organized while providing a task your child can excel at performing. • Maintain a grocery list. Help your child come up with a list of important household items to check on a regular basis, such as looking through cabinets to see which groceries the family needs. Younger kids can work from a printed chart. • Try pick-up duty. 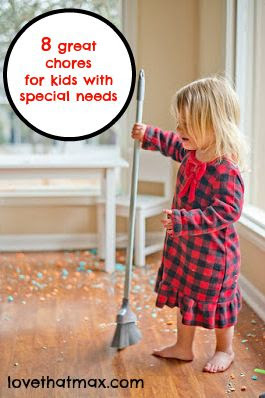 Have your child remove items from the floor so that someone else can vacuum. If your therapist or school is teaching your child desensitizing strategies, you can also try easing them into vacuuming by doing it in short bursts, then gradually increasing the area or number of rooms they complete. Put it to good use with meaningful household contributions! Look for tasks that involve bending, moving and lifting and try to pair them so that your child moves from one to the another and then back. • Create laundry time. Have your child pick up his own clothes; carry hampers or laundry bags from rooms to the washing machine; and sort, wash and fold the clothes. Finally, they can return hampers and clean clothes. Pick and choose your child’s laundry responsibilities depending on their age and stage of development. • Do dish clean-up. This is a multi-step task, perfect for kids with lots of energy—especially if dishes are washed by hand. For dishwashers, your child can rinse, load and unload. Take time to demonstrate the value of your child's chores; for example, point out how what he or she has done makes something easier or better for you or the family. If your child sees that his chore helps loved ones, they will be more engaged—and more likely to excel at chores. Understood.org is a new, comprehensive online resource for access to experts, personalized recommendations, interactive tools, and a social community for connecting and sharing tips with parents from around the country. What kind of chores do you have Max do? Payment is a good incentive for a child who understands the concept of money. Max now gets allowance, only if he does his chores! I struggle with this for Jack. He doesn't have the coordination to do most physical tasks, and he gags when trying to feed the dogs from the strong smell of the food. Any suggestions for an almost 7 year old with limited motor skills? This is a very helpful list. My favorite is electronic engagement. My son would LOVE that job- and someone has to do it! Great ideas! So important to start early including children in family routines. I personally don't like the word "chore" because it has such negative connotations, I prefer to talk about tasks that are part of the family contribution-- we all do things that contribute to the famiky-- and later on can translate into making a contribution at your work place.